15 points quartet are happy. Photo by IceHockeyMedia. 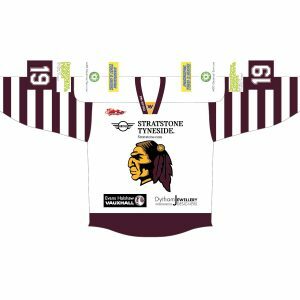 Whitley Warriors accomplished a 12-6 home victory over Sutton Sting on Sunday evening to record a fifth consecutive win. 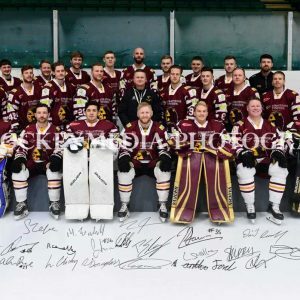 Filing onto the ice with nineteen skaters, Whitley Warriors found themselves up against a shortbenched Sutton Sting whose fifteen-man team included top points scorer Stanislav Lašček, hardworking forward Dominic Martin, versatile winger Ryan Johnson and recent signing Steven Duncombe. David Longstaff scores Whitley’s opening goal. Photo by IceHockeyMedia. 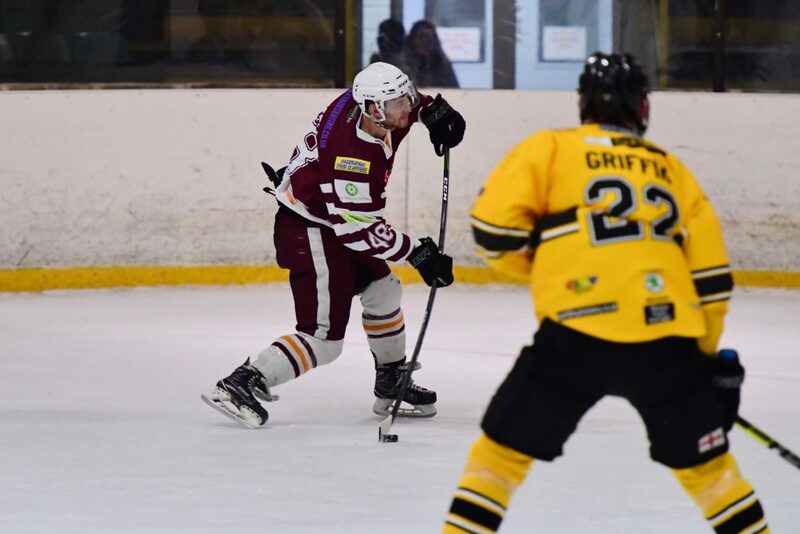 Setting his sights on goal, forward Callum Watson was punished for crosschecking just twenty four seconds into the first period when he saw his shot saved by netminder Warren Gilfoyle before reacting to Jordan Griffin’s defensive efforts. 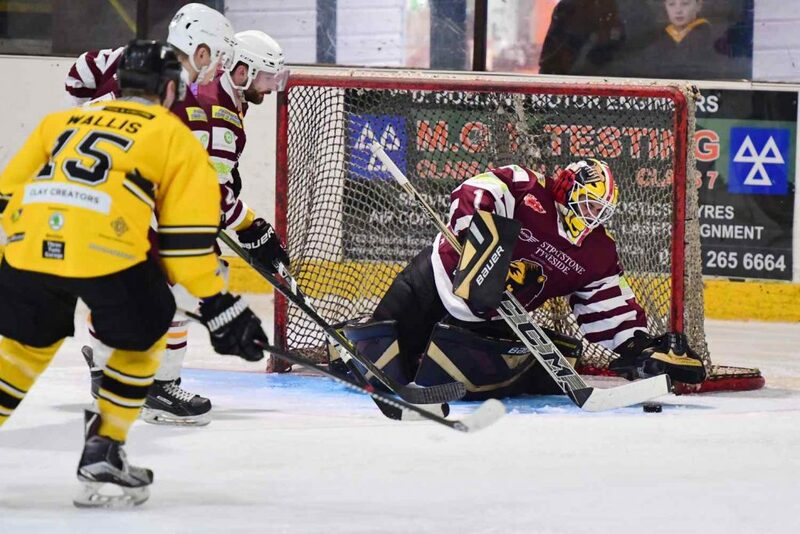 Though their penalty kill was a success, the Warriors conceded just thirteen seconds after returning to full strength when Griffin went bar down to beat Whitley’s starting shot stopper Jordan Boyle. Remaining strong in spite of their depleted numbers, the Sting doubled their lead on 6:34 as Captain Scott Morris slotted home his unassisted effort. This goal adding to Sutton’s confidence, Whitley grappled to achieve possession which they found difficult to maintain. After failing to make the most of defenceman Peter Tóth’s interference penalty on 10:44, the Warriors were handed another chance when blue liner Duncombe was sidelined for slashing. Determined to make this power play count, Player-Coach David Longstaff took just seven seconds to halve his side’s deficit from a narrow angle with support from left winger Ben Campbell and Alternate Captain Sam Zajac. Gaining momentum in offence, forward Jordan Barnes boarded Griffin but went unpunished for his actions. Dishing out their own justice as a result, the Sting lost track of the puck which was played from Canadian forward Phil Edgar to Zajac who equalised on 15:12. Expressing his frustration, defenceman James Goodman received a ten-minute misconduct penalty but the Warriors would not let up and took the lead just forty seconds later when Campbell turned in Sutton’s defensive zone to release a bullet-of-a-shot following build-up play from Longstaff and ‘D’ man Harry Harley. Continuing to pose a threat, Shaun Kippin’s attacking play provoked a hooking offence from forward George Crawshaw, allowing the Warrior to punish Sutton’s misdemeanour with a power play goal on 19:41 following assists from Campbell and blue liner Ross Connolly. Ben Campbell about to release his shot. Photo by IceHockeyMedia. Keen to extend their lead early in the middle stanza, the Warriors found the net just seventy three seconds in when the puck trickled beneath Gilfoyle following a shot from Connolly. 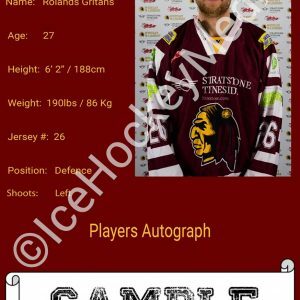 Soon, Sutton’s frustration began to show as Captain Dean Holland was boarded by defenceman Craig Wallis which prompted a reaction from Watson to see the duo respectively incur penalties of 2+10 for boarding and two minutes for roughing. 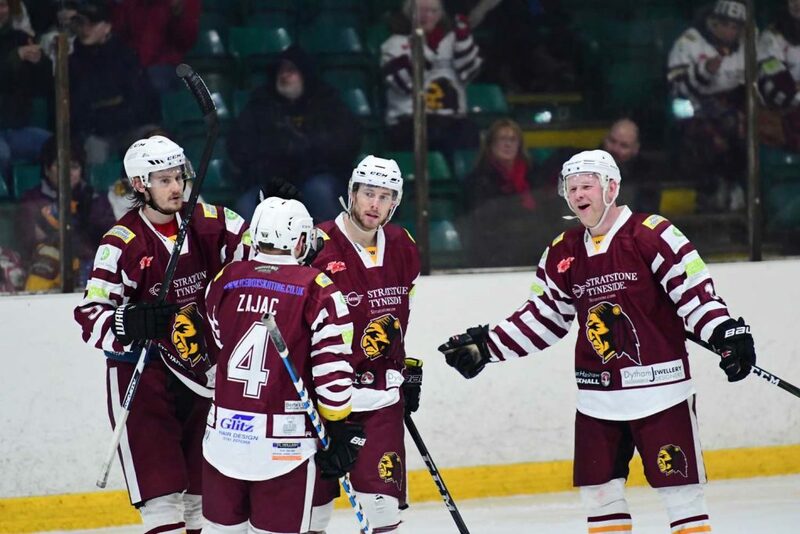 This made little difference to the Warriors however, as the side achieved a 6-2 lead nine seconds later when Campbell collected his second of the game courtesy of Zajac and Kippin. Though Sutton called a timeout immediately after this goal, Whitley would not be stopped and added a seventh to their tally on 25:20 as Holland made the most of Edgar’s clinical play to print his name on the scoresheet. Subsequent to this goal, both teams struggled to maintain full strength as a result of successive calls from referee Steve Brown. An interference penalty for Zajac was swiftly followed by a tripping offence from Duncombe and these penalties had not been served before defenceman Liam Smedley was punished for high sticks and Morris was sinbinned for holding. Moments after these penalties were served, a bench minor for Whitley followed and a clash along the boards between Smedley and Duncombe saw both players sidelined. Despite this, the Warriors showed fortitude to continue their scoring as Zajac raced through Sutton’s defence to score just past the midpoint of the period whilst Campbell completed his hat trick with a shorthanded goal just over two minutes later following a superb assist from Latvian defenceman Rolands Gritāns. A slashing penalty for forward Niall Ryder then proved too much for Whitley as Goodman fired a fantastic blue line shot beyond Boyle to make it 9-3 on the power play; Johnson and Lašček assisting. Twenty seconds later, Duncombe was sinbinned for slashing but Kippin was quick to join him after a tripping offence. Breaking free of Whitley’s defensive zone, ‘D’ man Josh Maddock received the puck from Holland and raced towards Gilfoyle’s net before releasing a shot which presented Barnes with an opportunity to find the target on 35:11. 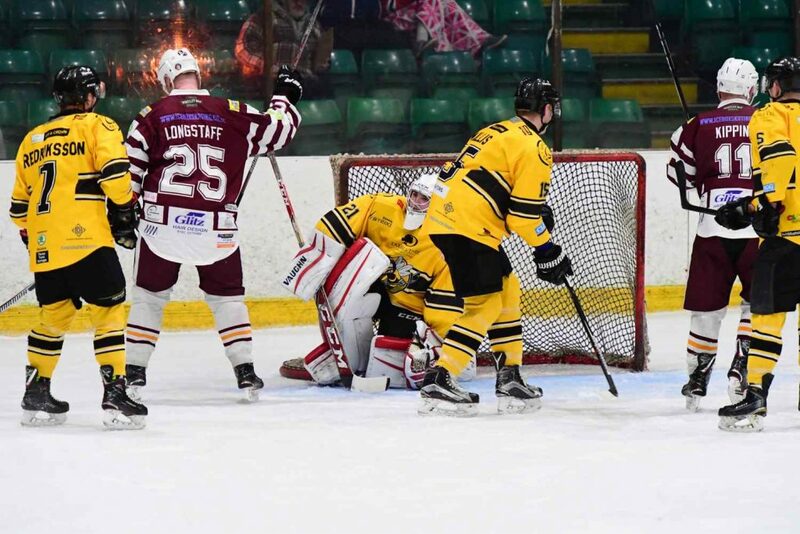 Less than two minutes later, Ryder looped the puck over Sutton’s defence to find Kippin who surged forwards to add an eleventh goal to his team’s tally shortly after his release from the sin bin. The game becoming fiery once again, Ryder and Swedish defenceman Jonas Fredriksson were made to sit out for interference and slashing respectively on 39:34 to conclude a second period peppered with penalties. Rory Dunn covers up. Photo by IceHockeyMedia. Switching Boyle for backup netminder Rory Dunn, the Warriors took an eight-goal lead into the final stanza but this did not last long as Martin buried the puck with support from Griffin and Morris on 41:15 to begin Sutton’s retaliation. Thirty seconds later, a slashing penalty for Edgar placed the visitors on a power play and the side showed that they were keen to make it count when Griffin and Morris teamed up once more to assist Fredriksson. Struggling to convert their attacking play in the opening stages of this period, the Warriors persisted in creating chances but it was not long before this resulted in a minor hooking call against Holland on 49:45. This penalty sparking a furious reaction from the captain, the Warrior incurred a further ten-minute misconduct penalty and a game misconduct for abuse of an official. Taking heart from their positive third period performance, the Sting battled to chip away at their deficit and their hard work was rewarded when Dunn’s attempt to save Lašček’s effort caused the puck to tumble over the netminder and into the path of Martin who snatched his second goal of the game on 55:48. Awarded a power play when Crawshaw was punished for a late hit in the final moments of the contest, the Warriors made the most of possession in their offensive zone to find Zajac whose perfect execution completed his hat trick with just over a minute remaining in the game. This goal concluding Whitley’s offensive exploits, the Warriors filed from the ice with a convincing 12-6 victory over an unyielding Sutton Sting.